Jupiter Farms homes for sale is a unique residential community with country lifestyle. Jupiter Farms homes for sale with no HOA fees. MLS Jupiter Farms homes. The 16-mile space is equestrian–friendly, so residents can keep their horses in their own backyards. It is not uncommon to see horses walking down some of the rural streets. However, Jupiter Farms is not completely cut off from modern life, as the homes are conveniently located near I-95 and the Florida Turnpike, making it easy to travel around the area. Living in Jupiter Farms lets residents enjoy a sense of community, in addition to great shopping, diverse dining options, and top schools. Jupiter Farms homes for sale is made up of single-family homes, many of which are located on lots that are horse-friendly. All of the Jupiter Farms homes for sale begin at 1.25-acre lots and scale up to 20 acres. Designs might be modern, with pools and upgrades, but there are also options to meet a more affordable lifestyle. Many Jupiter Farms homes for sale are situated on rural streets and others have paved roads. The variety of Jupiter Farms homes for sale lets future residents pick the best one that suits their needs and budget. Just outside their homes, residents get to watch a wide range of local wildlife, such as bobcats, great blue herons, ospreys, hawks, and sandhill cranes. Jupiter Farms has recreational amenities both within the community and just outside of it. For instance, Jupiter Farms Park has a wide variety of activities, including baseball and softball fields, a pavilion reserved for community members, and playgrounds. Public equestrian facilities are available, featuring sand and grass arenas in addition to horse trailer parking. 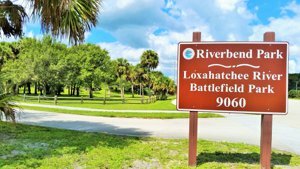 The nearby Riverbend Park in Palm Beach County has scenic views at the start of the Loxahatchee River and nearly 1,000 acres to explore. Get your easy access to all of the Jupiter Farms homes for sale today. call the Jupiter Farms Experts, Thom and Rory. Lots of great shopping, dining, and entertainment is available for Jupiter Farms residents. Equestrian Park Grill echoes the theme of the homes nearby and serves American cuisine. A variety of dishes can be found at other eateries, including Asian, Italian, and Mexican. For groceries, several Publix chains are conveniently located close to Jupiter Farms. To find new trends, a TJ Maxx and Urban Outfitters are a short drive away. Jupiter Farms residents are close to the widespread of shops, restaurants, and entertainment in Jupiter. The newest addition to the Riverwalk is Harbourside, a center for dining, shopping, and entertainment. Options include the always tasty and highly recommended Calaveras Mexican Cantina, along with Bravo Italian, BurgerFI, Tommy Bahama, and more. If movies are your thing, you can watch the latest movies in a luxury setting, try the new Cinepolis, just across the street from Harbourside. Comfortable leather chairs, premium concessions, and top-of-the-line sound systems make movie-going an upscale experience. Just down the street from Harbourside on the Riverwalk, in Tequesta are craft beers from Tequesta Brewing Company, an organically certified brewer with over 40 beers in a year. Stop by the nearby new location in the Farms Publix plaza for a delicious dinner or lunch at Tabica Grill restaurant. For the latest fashions, the Gardens Mall boasts designers like J. Crew, Michael Kors, and Coach, plus, many fine restaurants like Coopers Hawk, Brio, PF. Changs and more. LEARN MORE ABOUT JUPITER HERE. Residents of Jupiter Farms are served by the School District of Palm Beach County. The area regularly ranks at the top for its educational programs. Several private schools are also located near the neighborhood. Higher education needs are met by the campuses of Florida Atlantic University’s Honors College and Palm Beach State College. See all currently listed and available Jupiter Farms properties below. HOMES IN THE JUPITER FARMS COMMUNITY WILL GO QUICKLY WHEN PRICED WELL. BE SURE TO GET ON OUR ADVANCED NOTICE LIST TO RECEIVE IMMEDIATE NOTICE OF THE LATEST LISTINGS PRIOR TO OR WHEN FIRST PRESENTED ON THE MARKET IN THE MLS. To get on Jupiter Farms waiting list Call: 561-741-9666 or Text: 772-349-8466.